[youtube=http://www.youtube.com/watch?v=lmQVNFsMJJg] Final testing of an immersive music project using a video camera, motion tracking technology, and original sound design. Levels, frames and tones are all adjusted. External speakers and a visualization program will be added day of presentation for added experience and visual representation. Partner in crime: Ryan Zak. Behind the scenes set up of our Eyecon Immersive project. In order to create the auditory ambiance needed for my final project in Ryerson's MA Media Production program, I recently went out into Sunnybrook Park in Toronto with a couple friends. The objective of the outing was to capture some environmental noise to use as a bed track in an experimental binaural recording project. The video above illustrates how we decided to set up in the park, using a set of bleachers to host my computer and binaural dummyhead rig. A friend and fellow sound recordist also set up his new AKG 414 mic to capture some sounds while we were there. My mobile recording rig is the same as I've used in studio's and venues around Toronto: MacBook Pro, M-Audio Firewire 410, homemade stereo-mono patch cable, 9V aux in-line power supply to a binaural dummyhead equiped with two SP-TFB-2 omnidirectional microphones. The sound recording turned out absolutely fantastic! At the start of the recording you can clearly hear a fly buzz behind the dummyhead, creating this movement and audible space that is really incredible when experienced through headphones. The positioning in the park was great to capture environmental noise. The sound recording features background birds chirping, a low rumbling of traffic off in the distance and the occasional plane roaring overhead every few minutes (it's difficult to escape traditional cityscape sounds even in parks and greenspaces within the city). These sounds help build the space through their volume and proximity to the dummyhead and microphones. Because the set up is recording binaurally, the spatial effect is hightened when compared to a mono or even stereo recording. Overall, the day was a complete success with even a few surprises (a fly buzzing across the dummyhead's path!). 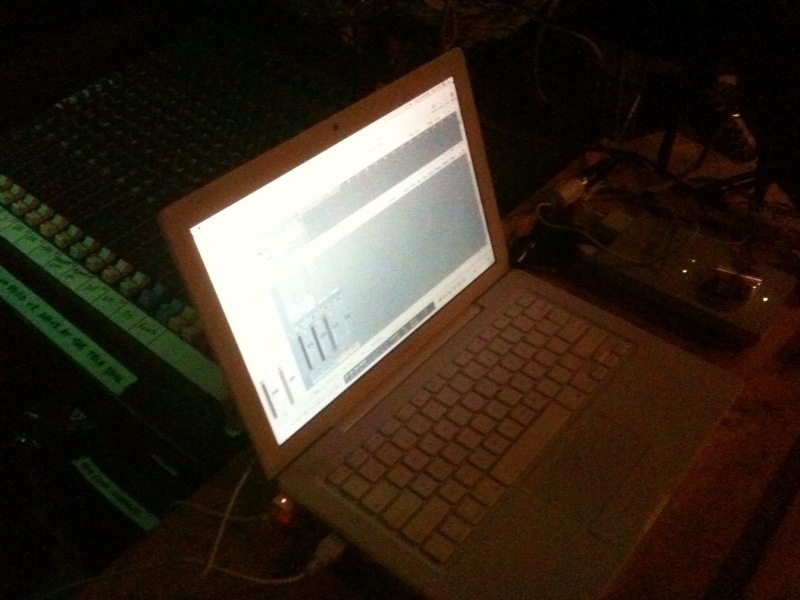 A sample of the field recording is coming soon. I am reducing some of the hum associated with the wind, and applying some filters to bring up the bottom end of the audio spectrum which is lost due to the types of microphones employed. Stay tuned! Post-production on all tracks involved applying some panning to clearly differentiate the spectrum of recorded sound, apply matched EQ (calibrated to pink noise in the foley studio at Ryerson University), and a denoiser filter to remove a low-level of hiss (which I must figure out the source of...). enjoi. 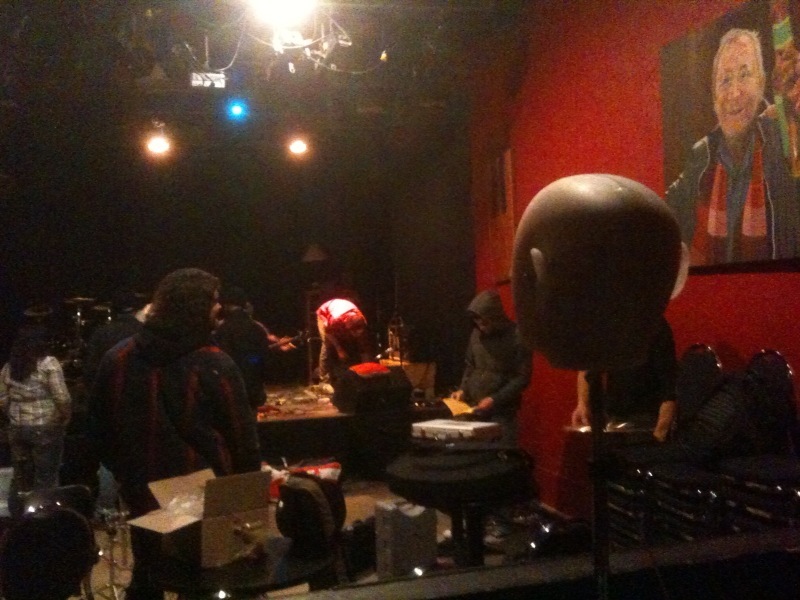 [soundcloud width="100%" height="81" params="" url="http://soundcloud.com/user6193556/binaural-crowded-room"] Binaural Crowded Room by airick On Saturday night I got the chance to set up my mobile dummyhead rig in a music venue in Toronto's Kensington Market. The Bread & Circus is a live music venue that hosts theater, jazz, alternative and indie rock shows every week. The aim of the evening was to experiment with capturing the large volume dynamics of the performing rock bands. There were three acts throughout the night; Mosh Pit Orchestra, Amaura & Speed of Service, all of which shared the usual rock characteristics of guitar, bass & drums at a substantial volume considering the size of the space they were performing in. I set up at the back of the room with my dummyhead, I/O box and laptop. All the usual pieces were in place; dummyhead patched through a 9V in-line power supply, split from stereo-to-two mono channels into a Firewire 410 interface, leading into my laptop. The stereo-to-mono cable was plugged into the front preamps of my soundcard and I believe this is where I ran into trouble. In loud environments, while using SP-TFB-2 mics and the 9V power supply, the line inputs on my soundcard should be used. I only discovered this information at the end of the night, scrolling through minute fonts on my iPhone, all the while horrified by the fidelity of what I was capturing. Attempts to pad the signal were fruitless during the performances. Even with the gain completely zeroed, clipping and distortion were prevalent. Moving forward I will try using the line inputs in loud recording environments, as well as try to understand how I can more effectively control input signals on the software side. I found it frustrating and strange that I had no control over the incoming signal through my audio interfaces hardware control panel. Moving sliders in the M-Audio control panel had no affect. Perhaps driver updates will correct this issue, but more investigation is necessary. The night was not completely fruitless; I did manage to capture some clean room noise, filled with a flood of conversations, bangs and cracks of musicians shuffling about on stage between sets, clinking glasses and a constant din of room reflections. As mentioned, two other mono lines were captured but won't appear here as they are not binaural recordings. [soundcloud width="100%" height="81" params="" url="http://soundcloud.com/user6193556/binaural-triangle"] Binaural Triangle by airick On Friday, April 23 I was allowed to record in the Glebe Presbyterian Church right across the street from my house. Bill Elliot, of the Church, was kind enough to let me into the space early in the morning to record using a fairly mobile rig of computer, soundcard, binaural dummyhead, cables and percussion instruments. The space inside the building is quite impression, and the reflections of sound from talking, clapping, playing drums really presented some interesting recording concerns. The process of getting set up and functional, especially on the software settings side, took slightly longer than expected but in the end everything was a success. 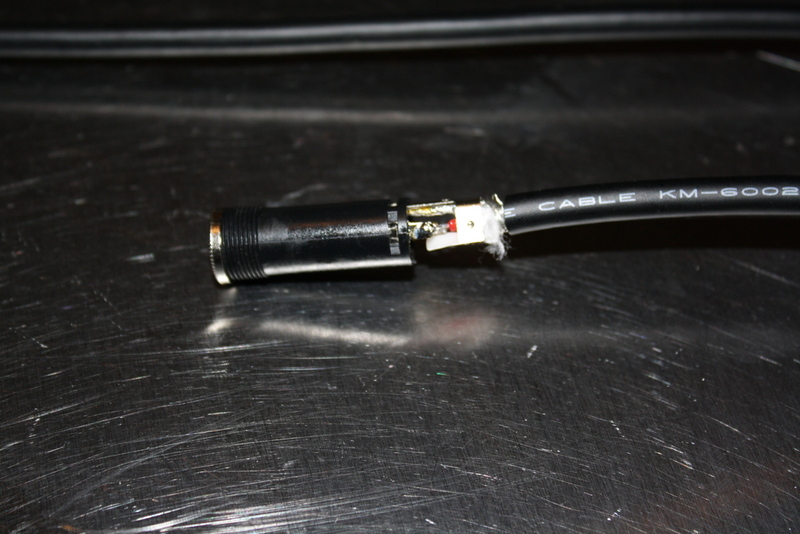 The microphones within the dummyhead had to be calibrated in order to properly function, based on their placement at the end of tubing "ear canals." Using a single monitor, placed 6' away parallel to the dummyhead ears, white noise was played and recorded through the left & right inputs in Logic. Using the "Match EQ" function in Logic, its possible to compensate for the distortions to frequency by the microphone placement. For example, there were noticeable distortions caused by the Church hall's large area starting at 600Hz, then spiking from 2.5kHz - 7kHz. http://www.dizziness-and-balance.com/images/master-ear.jpg I've ordered a pair of standardized silicone ears from a manufacturer in the US, who has built his own binaural dummyhead for recording purposes. The ears cost me $129.00. Apparently I could've made my own but the cost of 5L of silicone (smallest drum available) is 1K so I made the split decision based on the investigatory nature of my project. 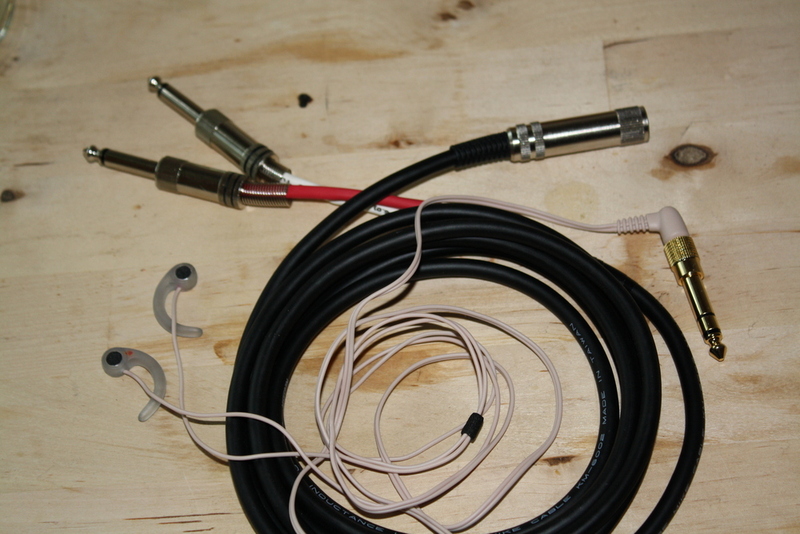 If you're interested in the process of building a dummyhead recording unit, check out Jeffrey Anderson's guide here. Ears are one of the most important aspects of a dummyhead recording unit, as they shape incoming sound waves before they enter the ear canal and reach the ear drum. A major component of building a successfully working dummyhead is understanding the physiological process of perceiving sound. Readings by Daniel Levitin, This Is Your Brain on Music, and Oliver Sachs, Musicophilia, offer a great deal of insight into physiological sensing of sounds. Additionally, understanding the fundamental properties of sound, it's potential in all objects and the physics involved in the creation, movement and reception of sounds is critical. The Fundamentals of Hearing, by William A. Yost is a great starter. It provides a methodical progression on the basic properties of sound waves, typical impacts on waves as they move through space, and the physics behind sound localization (like HRTF, for example). My uncle, who taught mathematics in Toronto's east end (Danforth Tech) for 35 years, was recently informed about my project on binaural recording and to my surprise dug out an old pair of headphones with microphones mounted in the specially shaped cups. Here's a link to some specific information regarding the specs of the cans. Not sure if I'll get a chance to hook'em up and test them but it would be cool to benchmark these against the dummyhead I'm currently working on. Haven't soldered since I was in high school, so I enjoyed it. Looking forward to possibly making some relevant parts for this project, such as an auxiliary power supply for field recording. Last night I went to see Leif Vollebekk perform a solo set at the El Mocambo as part of Canadian Music Week. I talked to the promoter about possibly recording the set from my perspective in the audience for my research project. She was cool with it so my girlfriend and I headed down with my SP-TFB-2 mic's, 60GB iPod Classic and Belkin - (which power the stereo mics). It's funny that bouncers always check for booze but rarely audio recorders. Probably for the best. I also recorded one track at a lower sample rate for comparison purposes not knowing that it would also affect the stereo recording, reducing it to mono. Apples and Oranges. Its a shame because the reduced bitrate actually improved the low end frequencies on the recording. The venue's natural frequency is really apparent in the higher sampled frequencies and it gives the recording a 'thumping' sound in some parts. I intend on EQ'ing the tracks but only slight to improve the clarity and quality. "The word 'equalization' reflects its historical origin, from when its main function was to restore inadvertent changes to frequency response...Microphones still often introduce marked changes, differentially responding to the frequencies present (Nisbett, 2007)." My intention is to compensate for the microphones distortions to improve the quality of the field recording. http://seanolive.blogspot.com/2009/06/validation-of-binaural-room-scanning.html - "Harman’s binaural room scanning (BRS) measurement and playback system. BRS is a powerful audio research and testing tool that allows Harman scientists to capture, store and later reproduce through a head-tracking headphone-based auditory display the acoustical signature of one or more audio systems situated in the same or different listening spaces." http://www.soundprofessionals.com/cgi-bin/gold/item/BEL-TUNETALK At $146.85, I pretty much got my pants pulled down for this thing. The only one available in the great city of Toronto heralded a heavy price, but it was worth it to simply plug in-ear microphones and subtly record onto an iPod. All too convenient for me to pass up. Immersive environments: - pure audio? As a part of Ryerson's Media Production MA program, a blog to record thoughts, information, resources and findings all in one universal destination, "the cloud." So here we go.